– Implement a donation matching program – for each donation made by your employees or raised at a specific event, your corporation can offer to match those funds raised – providing more funds for our beneficiaries. – Bring our talents to your organizations’ events – would you like for us to come to your organization to help with a corporate event or fundraiser? Our members are available to bring our “unique fashion” to your organization. – Provide volunteer opportunities for your employees – encourage your employees to volunteer to assist us at our events. We have worked with several organizations to provide opportunities for their employees to volunteer with us and have your organization reimburse them for their time and donate to the Imperial Court of New York as well. – Assist with your corporate outreach or diversity programs. 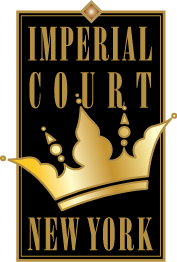 Interested in working with the Imperial Court of New York? In addition to those listed, other sponsorship and underwriting scenarios can be customized to suit your organization’s needs. Like individuals, no two organizations are alike and we all have differing needs and requirements. No matter the size of your business or corporation, you can be assured that there is an opportunity to work with the Imperial Court of New York suited to your desired level of investment. Contact us at sponsorship@icny.org and see how we can work together to further our and your corporate charitable mission.